Our adventure starts at the Horton Grand Hotel. 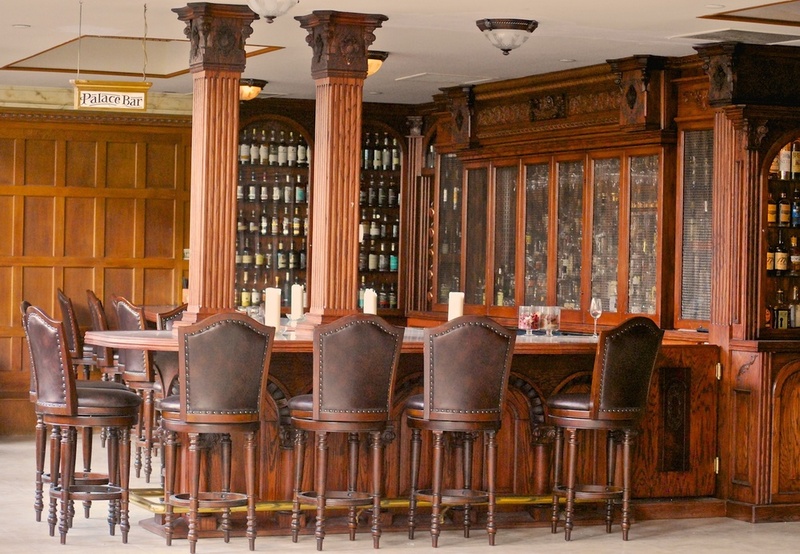 We check in, and drop off our items before venturing out into the Gaslamp. Here are some quick facts that we’ve learned about this hotel. It was built in 1887 as a luxury hotel designed like the Innsbruck Inn in Vienna, Austria. The interior design was inspired to be of Italianate Victorian architecture style. We also learn that this is not the hotel's original location! It was previously at the current site of Horton Plaza. The Horton Grand Hotel was dismantled brick by brick and rebuilt at its current site on the corner of Fourth Ave and Island Street. We ask the front desk for suggestions of places to see. We wanted history! — no bars or clubs, those can wait until later in the evening. They suggest that we visit the San Diego Chinese Historical Museum just around the corner first, and also the The Gaslamp Museum at the William Heath Davis House— we hear that it's haunted. Boo! Excited to explore the Gaslamp Quarter's history, we make our way toward the San Diego Chinese Historical Museum. You are greeted by wonderful artifacts from China and the historic San Diego community. 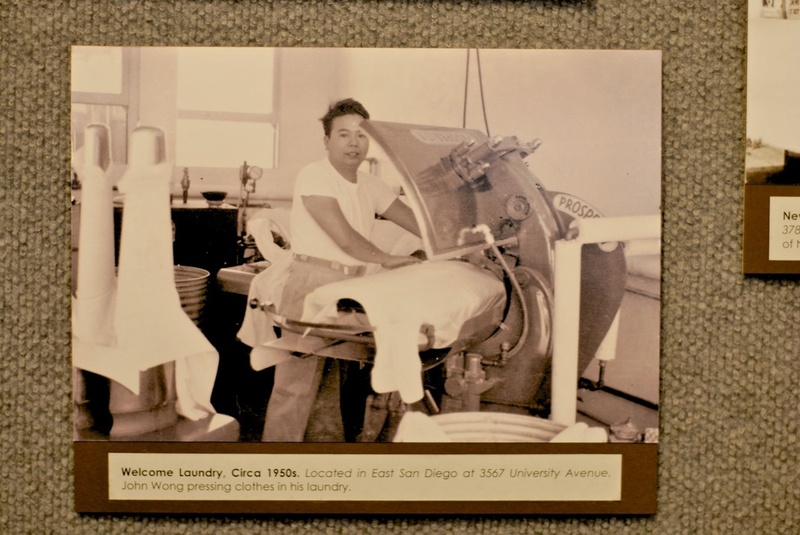 Laundry services and fishing was the cornerstone of the San Diego Chinese community. The museum has recreated what Chinatown would have looked like in the 1880s. On the corner of 3rd and J Street sits a small all-white one story building, however, do not let its modest appearance fool you. This building is no less historic or important than any of its Gaslamp Quarter neighbors. This is the San Diego Chinese Historic Museum. Pushing the door inward and stepping inside, we are quickly greeted by a smiling museum caretaker. The friendly employee tells that there is a $2 suggested donation for entrance; we’re happy to donate. Then, she gives us a brief yet very interesting history lesson about Chinatown in old San Diego. We learn that, although, the Gaslamp Quarter is now known for its bars, clubs, and restaurants, it was once the site of San Diego's Chinatown. Located between Island Ave., K St, 1st Ave, and 3rd Ave, this area of downtown was home to much of the Chinese population in San Diego. 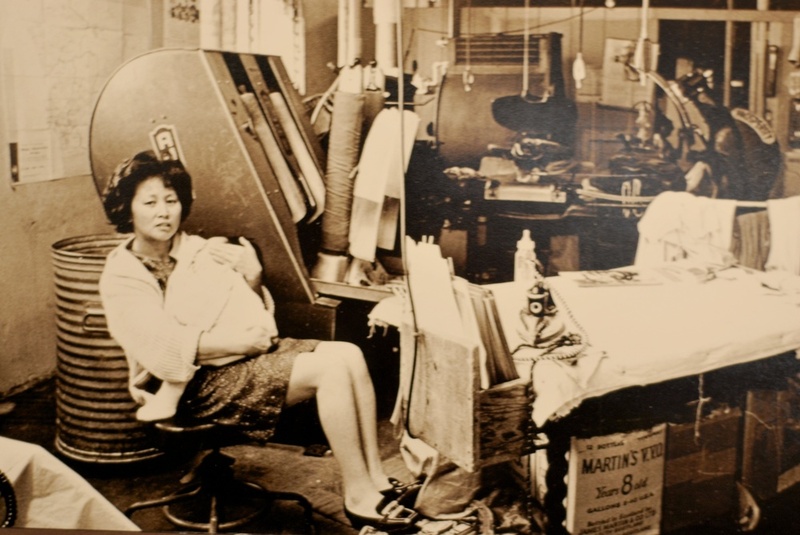 From the 1880s to 1930, this community thrived with a number of dry cleaners and a successful fishing industry before being overrun by opium dens and gambling. She also explains that included with the local artifacts are a number of ancient relics donated by local supporters or purchased by museum funds. Finally, she invites us to stay as long as we want, and to feel free to take many photos. The museum is beautifully organized with ancient Chinese artifacts on the right, and local San Diego items on the left.. An hour passes by quickly as we explore the room. We make our way to each exhibit, photographing nearly everything. After thoroughly exploring the main room, visiting the outdoor patio and Koi pond, we decide it’s time to head to our next stop. Making our way to exit, the museum’s caretaker who we spoke with earlier hands us a flyer just as we reach the door. "There's going to be a Chinese New Year’s celebration on February 8th and 9th," she says, "you should come back and celebrate." "Looks like we're going to celebrate New Year's twice this year," Jigger says with a smile as we leave the museum. It's about 3:30pm as we head to the next suggested stop, The Gaslamp Museum at the William Heath Davis House — it's said to be haunted. We quickly reach the William Heath Davis House which is also the museum. The yellow saltbox style home is the oldest surviving building in the Gaslamp Quarter, and is known for being haunted. Making our way to the entrance, I can't help but notice the tall black iron-rod fence lining the perimeter, or the giant ogre like tree arching its large dark branches over much of the house. It’s midday, and already the house has a spooky vibe about it. Excited to explore this haunted landmark, we take the flight of stairs leading below ground, and toward the house’s entrance. Just inside the door there is a hunched man and an information desk where you pay the $5 admission; there are student and military discounts available. The man, who, on second glance was only bent over typing on his computer, is really the museum's caretaker. He greets us, and then gives brief explanation about the house. He also mentions that they have a very popular haunted and paranormal tour during the night that explores the house for spirits and ghosts. I'm always up for a good haunted tour, but since we are so tight on time, we decide to guide ourselves. "Very well," he says as he slowly lifts his long arm and uncurls his finger, pointing to the door at the far wall. "That will take you inside," he finishes. We walk through the doorway and up a set of narrow stairs. I can hear from over my shoulder a soft voice tell me to not let my eyes play tricks on me. "You might see a ghost," the voice says. As we venture in, the house becomes strangely silent. I think that I hear Jigger say something to me. "We used to run through here...," a soft voice says. "What?" I called to Jigger. "I didn't say anything," he calls back from down the hall. I feel the urge to turn left through another door. A draft of wind blows across my neck sending shivers down my spine. I feel the need to photograph this room. Are my eyes playing tricks, or did that dress just twist toward me when I took the photo? Jigger appears down the hall. "You okay?" he says, "I'm heading upstairs." "Okay. Gotta tie my shoe," I reply. Standing up, I reach for the spot where I had set down my camera. It's been moved, and is now sitting on top of the newspapers, pointing toward the staircase. "Did you move the camera?" I call up to Jigger. "Nope," he replies from upstairs. Goosebumps run across my body. As I reach for my camera, I can't shake the feeling of being watched. "Jigger? Are you up here?" I call. The room is empty, but I feel the need to photograph it. Lifting the camera to my eye, I begin snapping photos. "This is my room," I hear a soft voice say. "What did you say, Jigger?" I ask. "Nothing," he replies from another room, "Didn't say anything." I find Jigger snapping a few photos of the bathroom. "This place is great....spooky....but great!" he says. I'm too distracted by what I've been experiencing. "Yeah," I let slip out. Still in the doorway to the bathroom, a chill blows by us. "Did you feel that?" I say. "Just a breeze," he says, but his face says more. "Time to go," I hear a voice say. "Huh?" Jigger says, " I didn't say anything...Ready to go? 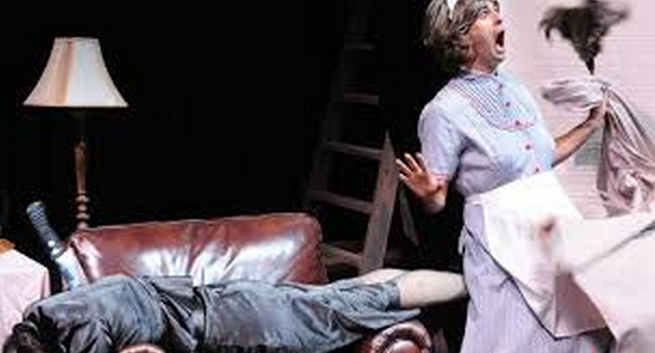 It's almost time for 39 Steps"
I don't say another word as we leave the house, and reenter the real world. As we leave the museum, I look to Jigger for any sign that he had the same experience as me. If he did he’s not showing it. The only thing he keeps saying was how interesting The Gaslamp Museum at the William Heath Davis House was. It must have been all in my head, I think to myself as we leave the museum and cross the street. We grab some food to go at a nearby restaurant, and head back to the Horton Grand Hotel to take a break before the show at the Horton Grand Theatre. We walk by the Palace Bar before heading back to our room. It’s still empty since it the daytime, but if you scroll to the last photo, you can see how busy it gets. There is live piano music and a saxophone player later that night. It sets the mood for a you-stay-classy-San-Diego night out. We order one of the Palace Bar's specialties, the Alex's Bitter Gin. It’s a stiff drink, the kind of the drink the likes of Kalakaua (King of Hawaii), Benjamin Harrison, Wyatt Earp, Jack Dempsey and Babe Ruth would have enjoyed. They probably did as they were previous guests of the Horton Grand Hotel. We could stay here the rest of the evening, but the show must go on at the Horton Grand Theatre. It is time for The 39 Steps! The Horton Grand Theatre is buzzing! A diverse full house. Some that look like San Diego locals, you can even picture which neighborhood they're from, and some with accents as thick as the mustaches of the actors on stage. You see, we don’t really know much about what The 39 Steps was all about. A couple of our friends from the UK have told us that it is a really funny show. They are right! It is a different kind of funny. We don't really want to spoil what the show is about, but let's just say that there are a lot of accents, secrets, spies, a gun, stiff bodies in compromising positions, and takes place from London to the Scottish Highlands. It is very funny, probably one of the funniest shows I’ve ever seen in my life. Even funnier than my mom. My mom is pretty funny. Towards the end, we are in awe and thankful to live in such a beautiful city. In about 39 steps from the corner of 4th and Island, we are able to see so much history about San Diego and the Chinese settlement in San Diego. We can stay in a hotel where kings and presidents have stayed, watch world-class shows, and I haven’t even written about the 100s of restaurants in a 5 block radius. The show ends to a standing ovation. The 4-people cast of Lamb's Players Theatre are worth the standing ovation. At the end of the show, they announce that the show is being extended into March! We highly recommend it! In fact, we're going to watch it again and bringing our family and friends.